The sweet potato (Ipomoea batatas) is a dicotyledonous plant that belongs to the family Convolvulaceae. 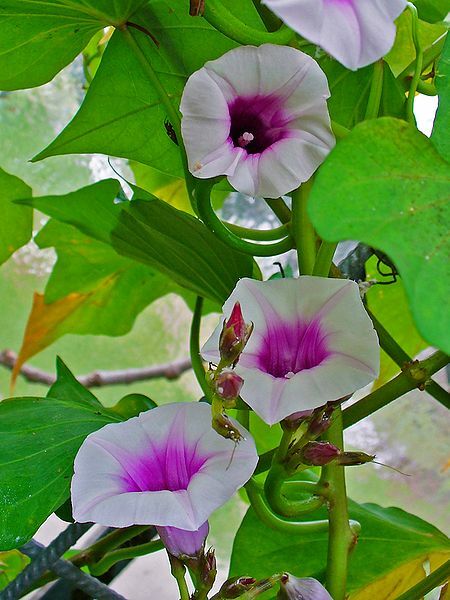 It is an herbaceous perennial vine that has white and purple sympetalous flowers, large nutritious storage roots and alternate heart-shaped or palmately lobed leaves. Despite its popular name, the sweet potato is only very distantly related to the potato (Solanum tuberosum). It is a storage root, not a tuber or thickened stem like the potato, and belongs to the morning-glory family and not the nightshade family. Despite a physical similarity, yams are not related to the sweet potato either. Cultivated forms of sweet potato have 2n = 6x = 90 chromosomes. Although some varieties of sweet potato are also called yam in parts of the United States and Canada, sweet potato is not part of the family Dioscoreaceae but belongs in the unrelated morning glory family Convolvulaceae. Sweet potatoes are mostly propagated by stem or root cuttings or by adventitious roots called "slips" that grow out from the tuberous roots during storage. True seeds are used for breeding only. Because they are sown by vine cuttings rather than seeds, sweet potatoes are relatively easy to plant. The rapidly growing vines shade out weeds, limiting the weeding that is needed. They grow well in many farming conditions and have few natural enemies; pesticides are rarely needed. Sweet potato genome research currently lags far behind all the other top-eight most important food and vegetable crops in the world. This is mostly due to the complexity inherent in its hexaploid genome, and the resulting lack of genomic and genetic resources and tools; the polyploidy and the high degree of heterozygosity of the sweetpotato genome make it infeasible for whole genome sequencing.This has hampered development of more effective precision crop improvement solutions such as the Marker-Assisted-Breeding (MAB) for sweet potato. As an alternative, the Genomic Tools for Sweetpotato (GT4SP) Improvement Project is developing high-quality genome sequences of diploid and highly homozygous accessions of Ipomea trifida and Ipomea triloba, the two closest wild relatives and putative wild ancestors of the cultivated sweet potato. The resulting two high-quality draft genomes will serve as references for cultivated sweet potato and as the foundation for next generation breeding technologies for sweet potato improvement. An AFLP-based Genetic Linkage Map of Ipomoea trifida (H.B.K.) G. Don., a Diploid Relative of Sweetpotato, I. batatas (L.) Lam.